The island of Tilos belongs to the Dodecanese complex and dominates between Nisyros and Halki, very close to the Turkish coast. Green plains, mountains, medieval castles and villages forgotten by time constitute key features of the island. 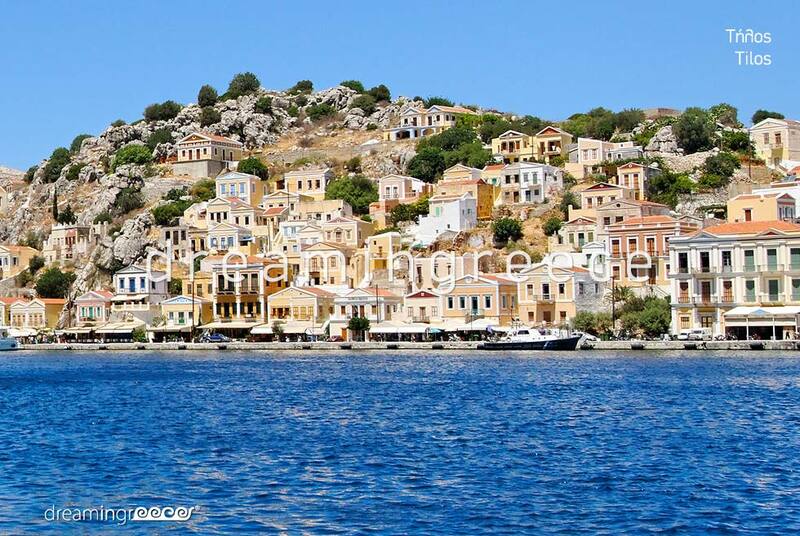 The capital of Tilos is Megalo Chorio, which is perched on the steep slopes of a hill. It is worth walking in the narrow streets of the city, between the picturesque, stone houses. Over Megalo Chorio, on the ancient citadel, the ruins of the castle, where you can enjoy magnificent views over Eristos beach and fishing village of Agios Antonios dominate. An important attraction of the capital is the church of Taxiarhis (Archangel), with pebbled floor, as well as the small museum. Within walking distance from Megalo Chorio, there is the famous Charkadio Cave where bones of dwarf elephants have been found. Over the Cave, there is Messaria Castle. During your stay in Tilos, it is worth visiting the ruined village of Mikro Chorio. The cobbled streets, the stone houses, the ruined walls, the castle ruins and the Byzantine churches which emerge among olive trees and oaks, create a theatrical setting, which promises a magical journey into the past! An important attraction is the whitewashed church of Panagia Theotokissa. On the southeast coast of Tilos, Livadia village, one of the most touristic places of the island, unfolds. There, you will find numerous café/bars, ouzo bars and taverns with sea views. Of great interest is the building of Government House, built by the Italians. 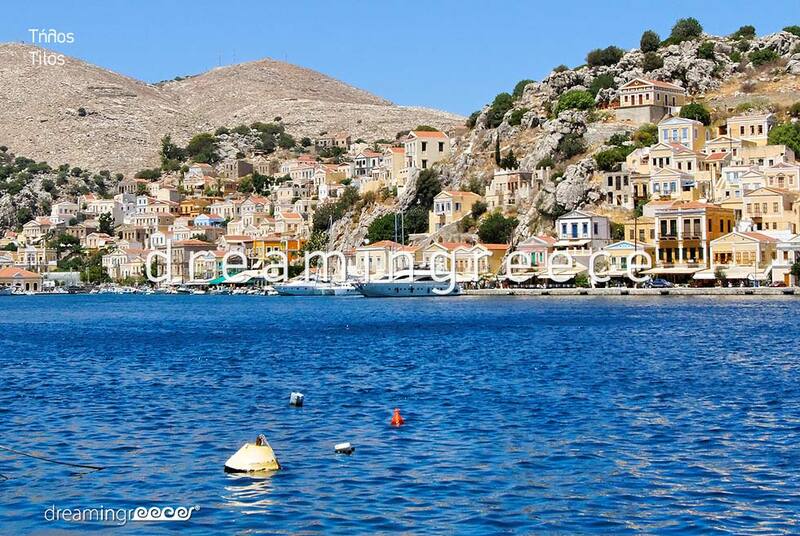 Following the coastal road you will reach the old, picturesque port of Agios Stefanos. Tilos is ideal for hiking, as it has a remarkable network of paths. Following the paths, you will have the opportunity to discover the hidden secrets of the island; green valleys, cypresses, oaks, almond trees and numerous partridges, familiar with people, make a scene which seems to have sprung from a children's fairy tale! Tilos, this tiny speck of land, located a stone's throw from the Turkish coast, is an Aegean paradise, ideal for tranquility and isolation lovers! The most popular beaches on the island are the sandy Eristos beach where you will find several trees which provide shade. Following the path which unfolds in the left part of the beach, you will be directed to two bays. If you love isolation, you will love the small, pebbly beach of Lethra. In Livadia beach, you will find an organized, pebbled beach with crystal clear waters. From there, small boats, approaching the beaches Skafi, Tholos and Agios Sergios start. On the north coast of Tilos there is the picturesque beach of Agios Antonios. West of Agios Antonios, the beautiful Plaka beach, with its magnificent waters unfolds. To reach the island of Tilos, you can travel by boat from the port of Piraeus, on the Blue Star Ferries line, as well as from the port of Rhodes on the ferries of Dodekanisos Seaways and Tilos Ferries. 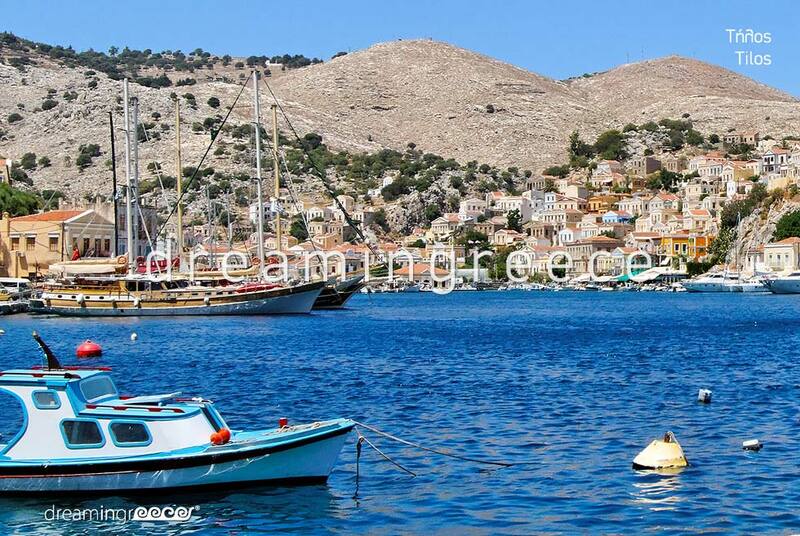 The island of Tilos is connected by boat with the islands of Kos, Rhodes, Nisyros, Symi and Halki. To reach Tilos, you can also fly directly from Eleftherios Venizelos - Athens International Airport, as well as from the airports of Rhodes and Kos and then take the ferry-boat to Tilos, as the island has no airport. For your transportation on the island you can use the local buses, but also taxies. Furthermore, you can either rent a car or a motorcycle from any rental office.